Sustainable development for a city and region are the content of the Urban Design & Architecture track. It deals with short and long term development strategies and functions as a catalyst for urban development. Moreover, it aims to create urban identity by applying innovative designs. Future-oriented urban renewal is one of the key challenges for the European city in the 21st century. It applies to mayor cities, urban agglomerations and small to mid-sized towns alike. The requirements for urban renewal especially imply holistic urban strategies, and approaches on a small-scale level. In this context spatial, functional, social, ecological and economic aspects are equally important. In times of resource efficiency, sustainability and budget deficits of city administrations attention cannot only be paid on new urban areas in the periphery. This is why the design course and workshop “Urban Renewal Villach City Center” focuses on the center of the historic city. Its substantial characteristics and potentials related to suburban areas need to be reflected on. We will work on proposals in form of small-scale urban design interventions in order to improve the quality of life in the city center, for inhabitants and visitors alike. The City of Villach with 60.000 inhabitants has a wide-ranging profile for an Austrian mid-size town. The high quality of life is based on efficient traffic routes, a small historic city center, its location by the river Drau as well the short distance to the surrounding lakes. The city developed from a historically known hub for train service and spa location to a highly frequented tourist region. In the course of time, suburbanization has led to the continuous loss of functions of the city center. Empty shops and the lack of activities are characteristic for the city center nowadays. 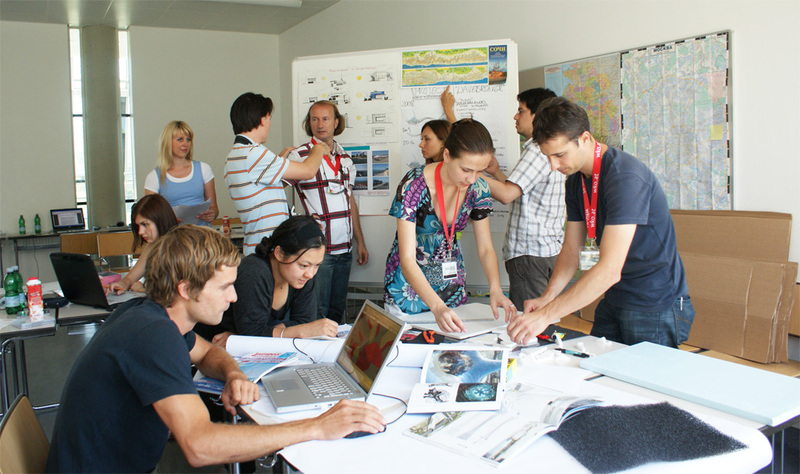 The aim of the Urban Design and Architecture Track is to work on ideas and concepts for the city core of Villach. The subtitle “small-scale – big impact” already implies the search for creative proposals through conceptual, selective approaches rather than through extensive, large-scale urban design proposals. This kind of “micro-urbanism” should be developed out of interdisciplinary, open discussions with colleagues and inhabitants. Which criteria define the development aims for city centers and what effects are to be expected? What (economic) incentives have to be implemented in order to boost creative urban renewal? How flexible must / needs a historically evolved urban structure react to changing needs of its inhabitants? Who are the current and future users and stakeholders who influence the development of city centers? The goal of the track: “Sustainable Urban Development and Architecture” is to make a conceptual contribution on the basis of urban design to the sustainable development of this region. The didactical emphasis lies on grasping the connections between the objective of policy and planning, the urban development dimension, and creative solutions. In short, the focus will be evenly placed on a results-based design process. Between two and three students will form international project teams that continue to engage in a permanent discourse with the tutors. There will be close cooperation with of the track “Tourism and Destination Management” to enforce transdiciplinary working methods. The final result will be a poster presentation, a model and a public presentation on the last day of International Summer University Carinthia.